Ask any baker what a pet peeve is for them and they will say wasted ingredients! 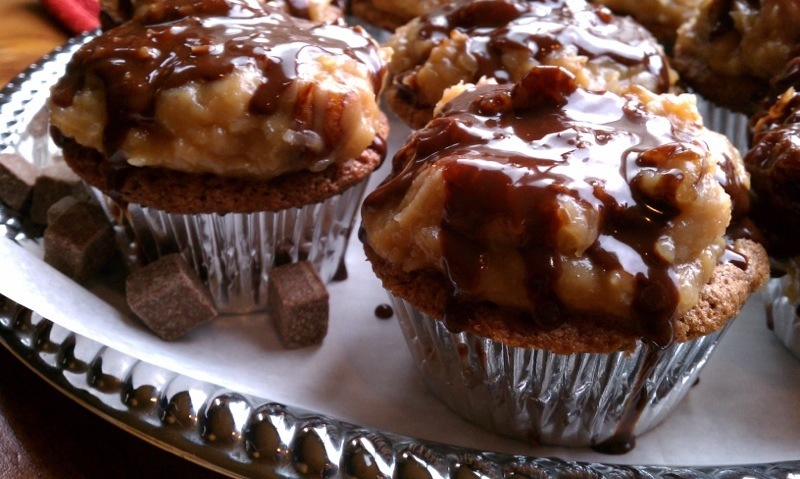 I attempted to make a recipe from a (will remain nameless) website for a German Chocolate Cupcake order and for some stink’n reason it flopped! I reviewed the recipe over and over to see what I did wrong and I’m left stumped. Ohhhh, the butter, the sugar, THE CHOCOLATE! All in the garbage. My desperate boys ate a couple of these failed cupcakes before I sent them to the land of cupcake misfits. 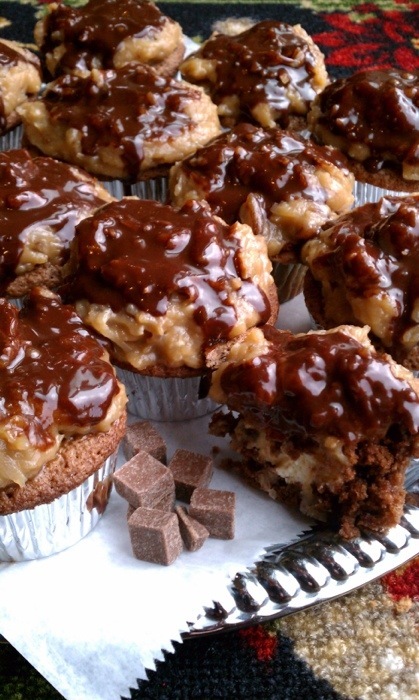 One big question I have to know from all you German chocolate cake lovers out there. Is it the cake you’re in love with? Or be honest, is it the frosting? My answer: FROSTING! Eat it by the spoonful, delish! Well, no screaming needed. These turned out pretty darn good I must say! I actually added cheesecake in the middle as if they needed more of a fat content to them. After I topped the cupcake with the frosting, I thought they looked a little plain. 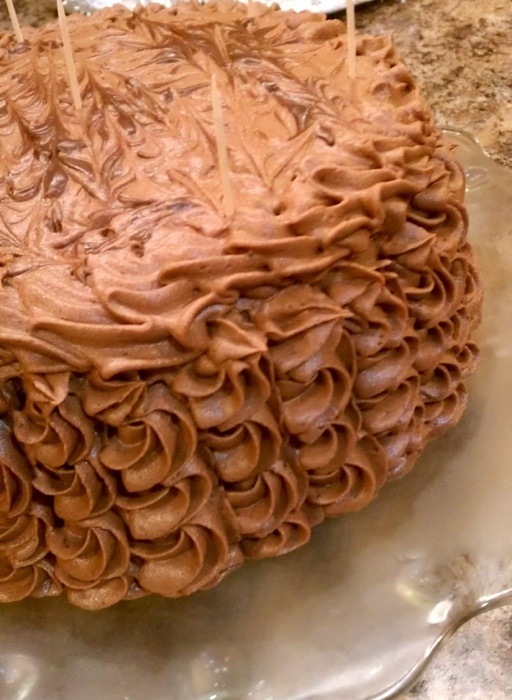 So, I poured on some chocolate ganache that I was using for another chocolate cake order. Preheat the oven to 350 degrees F. Line 24 regular muffin pans with muffin cups. Sift the flour, cocoa, baking soda, and salt together onto parchment paper. With an electric mixer on medium-high speed, cream the butter and sugars until light and fluffy, 4 or 5 minutes. Add your eggs, 1 at a time, mixing until completely incorporated before adding each additional egg. Mix in the chocolate and vanilla, making sure to combine really well. Turn the mixer to low and slowly add the dry ingredients, alternating with the buttermilk, in 3 batches, starting and ending with the flour mixture. Make sure to let it mix thoroughly. 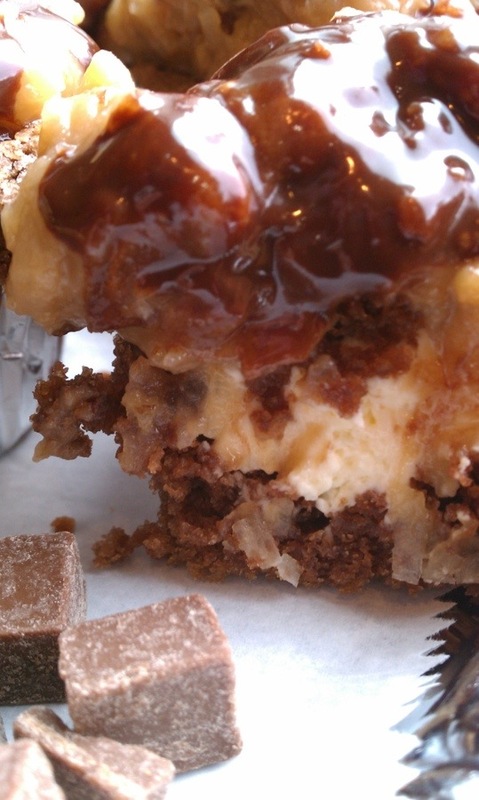 Use a 2-ounce ice cream scoop and portion out the Chocolate Cake batter evenly into the muffin cups. Pop the pan in the oven and bake 25 to 30 minutes, turning the pans halfway through. You’ll know it’s done when a toothpick inserted in the middle of the cupcakes comes out clean. Let the cupcakes completely cool in the pan on a rack. Once cupcakes are cooled completely, remove about the size of a quarter amount of cake from the top and fill with a heaping teaspoon full of cheesecake filling. Replace the removed cake back on top of the cheesecake filling. Cook’s Note: Make sure all of your topping ingredients are at room temperature, except for the shredded coconut which you should keep in the refrigerator or freezer just until needed. For the topping: Put the egg yolks, evaporated milk, brown sugar and butter in a separate saucepan. Place it over medium heat and cook until the sugar dissolves and the butter melts. Continue cooking, stirring constantly until thick, 8 to 10 minutes or so. Take off the heat and stir in the vanilla, salt, coconut and pecans. Allow to cool. Scoop the topping on the cupcakes with a heaping 1/2-ounce ice cream scoop. 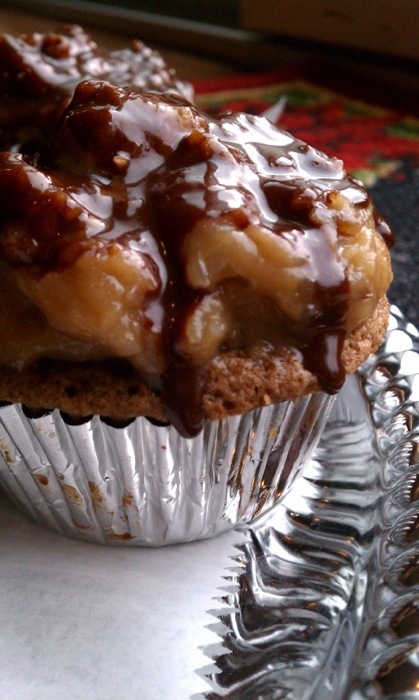 Drizzle with a chocolate ganache or glaze. 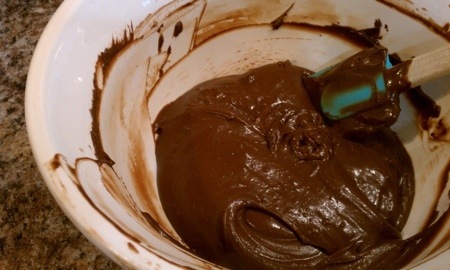 *Side note: With the extra chocolate ganache I whipped it into a rich chocolate mousse for my layered chocolate cake. ← Zingermans Let’s Bake Cookies! Ok Tahny, I know what I said the other day but after seeing the picture of that cupcake, there better be one on my doorstep when I get home! I just want to dive into the picture! Get some restraint! Who am I kidding….I have none! 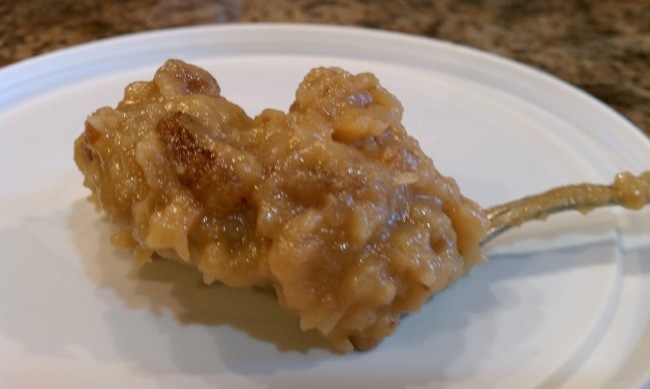 Not a big German Chocolate fan, but as usual Tahny, you make everything look yummy and leave me wanting…I would come over and eat those rejects any day…you did not throw out really did you? You could have frozen them and made a trifle out of them!!! I find that sometimes you just have to use the “good” chocolate or it messes up a recipe…I have a pot de`creme recipe that just has to be made with Giradelli Chocolate or it flops!! Tahny, I’m almost drooling again, looking at these cupcake photos. I agree with Lorraine. You could have a several of us at your door to help you get rid of the “flopped” cupcakes or cookies. I didn’t know there was a ready to use Philadelphia Cream Cheese filling! Everytime I read your recipes I learn something new. Thanks for sharing them. Great job Tahny! It’s wonderful to see you’re practicing your baking skills and learning from your experiences.